We face proposals for construction of at least three 42-inch pipelines for moving shale gas across the mountains from West Virginia to Virginia and the southeast. These pipelines will be the largest ever built in this region. Pipeline construction on this scale, across this type of landscape, will result in the degradation of downstream water resources, including brook trout streams, water-supply recharge areas, and hydrologically sensitive karst systems. 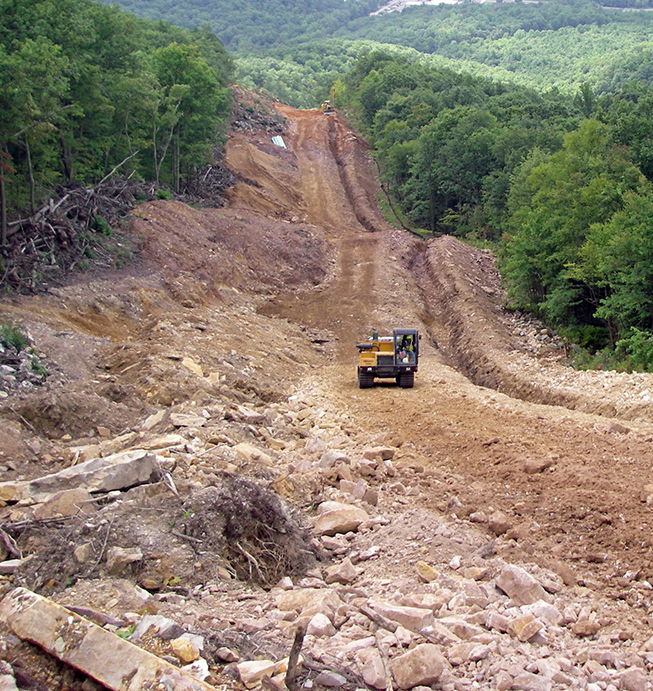 Excavation of 125-foot-wide corridors over steep forested mountains. Heavy-duty transport roads and staging areas for large earth-moving equipment and pipe delivery. Extensive forest clearing, soil compaction, bedrock blasting, and excavation through streams, riparian areas, and wetlands. In recent years, Virginia has made real progress in protecting water resources from careless development. New regulations serve to minimize erosion and sedimentation and the alteration of stream channels and aquatic habitat due to uncontrolled runoff. Pipeline construction, however, is effectively exempt from the regulatory oversight that applies to most other large construction projects. Pipeline construction companies are largely self-regulating with respect to erosion and sediment control (E&SC) and stormwater management (SWM). Whereas most construction projects are under the jurisdiction of local E&SC authorities, pipeline construction companies are instead subject to Annual Standards and Specifications, which allow the companies to perform their own compliance review and conduct their own inspection programs —using company-hired plan reviewers and inspectors. The Virginia DEQ has a responsibility to regulate pipeline construction to prevent water resource degradation, but the DEQ does not have a program in place to meet this responsibility. The DEQ is supposed to review and approve Annual Standards and Specifications submitted by pipeline construction companies. The DEQ, however, has not allocated staff resources for this task, and has simply extended approvals for out-of-date 2013 submissions —which do not require control of post-construction runoff. This is a critical issue for pipeline construction in mountainous terrain. Pipeline construction companies are required to prepare site-specific E&SC plans. The DEQ has the authority to require submission of those plans, but the DEQ has not allocated staff resources for plan review and has therefore not required plan submission. As a result, no one other than company-hired plan reviewers are able to access and review the E&SC plans for compliance with state requirements. The DEQ has the authority to inspect pipeline construction projects, but does not do so unless there is a water-quality complaint from the public. Although pipeline construction companies are required to conduct their own inspection programs, inspection reports are typically kept in onsite construction trailers, where they are not available for review by the public or local government representatives. Although the pipeline construction companies promote the perspective that water resources will be protected by a well-tested, transparent, and effective regulatory system, this is not the case. We cannot count on state government to provide the necessary oversight and accountability. It is therefore up to the concerned public and local government officials to engage directly in the process. If we want to protect our water resources, we cannot rely on the DEQ, and we certainly cannot leave it to the pipeline companies. A critical first step is to obtain and review the all-important site-specific E&SC plans for regulatory compliance. The laws and regulations are in place; we must make them work. Many localities have the expertise and resources to review E&SC plans, even if the DEQ does not. And the Dominion Pipeline Monitoring Coalition is undertaking a project to support citizen review of these plans. We will post the E&SC plans on our website. We will provide the information needed to effectively review the plans. And we will assemble a team of experts to support and assist with plan review. First, though, the E&SC plans must be made available for timely public review and inspection. The Dominion Pipeline Monitoring Coalition encourages citizens, conservation groups, and local government officials to petition Virginia’s DEQ, Secretary of Natural Resources, and Governor to ensure timely public access to E&SC plans for pipeline construction projects. This entry was posted in Erosion and Sediment Control, Regulatory Compliance, Water Resource Monitoring by Rick Webb. Bookmark the permalink.